This page will go over all the basics that you need to know in order to set up BossShopPro. You can either set up everything by hand or use the helpful configuration tool. How to set up shops by hand? The 'shop file' is a file you can create yourself, Every 'shop file' is a GUI/Chest Inventory, You can place any item in any inventory spot in that GUI. Lets start out by creating a new shop file and explaining the layout of the file. When created, Open the file with a text editor. Lets use the following options to begin our file with, But do not save the file just yet. ShopName is the internal namsade of the shop which we can reference to as this shop. Command: Here you put in the commands players can open the shop with. You can separate multiple commands using a ':'. If you do not want the shop to be connected with a command simply remove the whole line. In this case the commands are "/example" and "/ex". The sign text is what you would type on a sign to make it open this shop, We will not use that in this example, If you want to use this you will have to enable this in the main config file. Now we are going to add an item to our shop..
'1' is the internal shop item name, To keep your file organized, Just use the inventory location here as I did in this example. Reward is what you are rewarded with when you click the item, The RewardType in our example shop is item, So I have defined type:STONE and amount:1 as reward. MenuItem is the item that is displayed in the GUI in-game, This can be anything you want.. 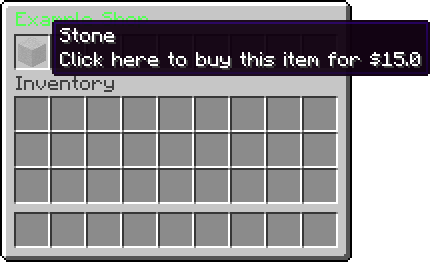 I chose to just display one stone block as item in the GUI, I have also defined a lore to the item that uses a placeholder. InventoryLocation is the location the item will be in the inventory, so 1 will put it in the first spot. Use 0 to make it automatically choose the next empty slot. ExtraPermission is the permission required to click the item, We wont be using that now. Now that you have added the options in the file and defined at least one item.. Go ahead and save the file. You should now have a basic understanding of how the BossShopPro 'shop files' work. How to set up the config.yml file? # You got BossShopPro? Awesome. # Believe me: Setting it up is simple. # OR you can edit it the Boss way: Use "BossShopProConfigure" (An awesome software which allows simple Setup with a few clicks). # If set EnableSigns to 'false' BossShop signs will be disabled. # That's the name of your Main Shop. Whenever someone uses '/bossshop', this Shop is opened. Other Shops can be opened via '/bossshop <shop>'. # Also, all Shops can be opened via Sign (If Signs are enabled) or with clicking a specific Item (If you have 'GuiShopManager' installed). # Put multiple Items on the same slot and hide the ones which are not available any more. For example if you work with upgrades, hide the old upgrade and show the next one. # but also might lead to accidently selling items below their worth. # If enabled all Transactions will be logged in a TransactionLog file. # If enabled BossShop will search children folders of the '/shops' directory for shop files. That can be quite helpful for sorting, when dealing with a big amount of shops. # If enabled players can use any Enchantment reward with any level to any item. # If enabled the damage weapons, armor or tools have taken is ignored when players sell them. # If disabled players can receive any itemstack with an amount up to 64, even if the material has a limited stacksize in Vanilla. That way players can get stacked tools and armor too. # It is recommended to keep this setting enabled to prevent players from enchanting multiple tools, weapons or armor parts at once. # If enabled and players purchase items which do not fit into their inventory these will be dropped on the ground at their location. If disabled the players will instead get a warning message. # Delay in milliseconds between successful clicks in order to prevent click spam. ## If the delay between two shopitem clicks is faster than the given time in milliseconds it will be detected as clickspam. ## Here you can define the amount of warnings the player will get before being kicked for clickspam. ## After the given time in milliseconds the plugin will forget offensive clickspam of a player. Note: When a player leaves the server his clickspam is forgotten too. # If enabled all economy related shopitem actions are executed in asynchronous tasks and do not affect the performance of the main server thread. # This feature is helpful if you are for example working with MySQL based currencies: When having external databases connected it might take some time until those respond. # In that case in order to harm server performance you can enable this feature. # The maximum amount of characters in a lore line before it gets cut into multiple lines. Set the value to '-1' if you never want lines to be split. # Here you can define how the balance of the player will be displayed. # Important: The order of the list is descending. The first entry where the needed number fits is chosen. # Here you can define how the points balance of the player will be displayed. # It has the same structure as the MoneyDisplay list. Points can not have as high numbers as Money and do not have decimals. # Here you can define the general display of numbers. ## Some formats are not displayed properly by the minecraft client because of the way it renders text. ## GroupingSize: Here you can modify the grouping size of numbers (the amount of digits between separators). Set it to -1 if you want to disable grouping. # If enabled the '%reward%' placeholder of shopitems with pricetype "ItemAll" will show the total reward the player will receive when selling all items of one kind. # time the shop is opened. It might cause lag in case of being used many times by a single shoppage. # If the player does not have any items to sell the text defined in messages.yml/"ItemAllEach" will be displayed instead of zero. # 'Reward: %money%' would for example show 'Reward: 100 each' with the default "ItemAllEach" text. # ExpUseLevels: If enabled rewards of type 'Exp' stand for "Exp level". Set this to false if you want to sell plain exp. This affects rewards only. # to automatically update after some time in order to make sure that the shops adapt to your players circumstances in live-time. # Here you can define the refresh-delay in ticks (20 ticks = 1 second). If you do not want the shops to auto-refresh set the value to -1. # Connects with servers and allows to use their player-count and motd in placeholders. ## Set this to true if you want to connect with other servers. ## You can define the pinging delay in ticks (20 ticks = 1 second). # the servers to ping are just offline you can set "FixConnector" to true in order to prevent the plugin from trying out other connector types. ## Here you can define the time (in milliseconds) this plugin will wait until it will cancel the pinging process due to not being able to ping a server. ## BossShopPro will wait the given time until it re-tries connecting with a server if it was unable to ping it last time. # Set to true if working with BungeeCord. # Here you can set up Price Multipliers. # If enabled, this MultiplierGroups will be loaded and players with the right permissions will get a price decrease/increase. # The lines of the List look like this: <Permission>:<Type>:<Multiplier>:<buy/sell/both>. # <Permission>: Here you can put in whatever you want. If you want a group to have this multiplier, just give that group your permission. # <price/reward/both>: Here you enter the range of the multiplier. It can affect either prices, rewards or both. If using prices or rewards the value is multiplied by the multiplier. # In case of using range "both" the prices are multiplied by the given multiplier and the rewards are divided by the given multiplier. If you do not define a range the plugin will automatically select "both". # Players can be in multiple "MultiplierGroups" at the same time. # Only important if you work with Points. # (If you are using one). If you use multiple Points Plugins fill in the name of the one that you want BossShop to work with. # 'PlayerPoints', 'CommandPoints', 'EnjinMinecraftPlugin'/'Enjin', 'PointsAPI', 'Jobs', 'TokenEnchant', 'Kingdoms', 'MySQL-Tokens', 'VotingPlugin', 'MySQLTokens'. # Sound sent to a player. Can be turned off by setting it to ''. Individual sound settings can be added to the configuration sections of your shops and shopitems, else they will inherit the sound settings of their parent. How to set up the pagelayout.yml file? # If set to true the layout shopitems are only shown as soon as the inventory size is exceeded and multiple pages need to be created. # If you want to display the layout shopitems in any case set this to 'false'. # This is the amount of rows that a shop can have without needing a second page. '6' is the limit but you can optionally make shops smaller. # Here you enter the first slot that should be reserved in case of the layout being active (When multiple pages are needed or 'ShowIfMultiplePagesOnly' is set to 'false'). # All higher slots of the same page including the given slot are reserved: Shopitems will automatically be put into the next page if they are equal or higher than the given slot. # You can use the reserverd slots to put in static layout shopitems. In this case the last (6.) row of every page is reserved in case of needing multiple pages. # Here you set up the shopitems that you want to be displayed in case of the layout being active. They are set up just like every other shopitem and can work with conditions. # Tip: Here you can use the additional conditions flag "page" that allows you to display components depending on the current page. # and there is a 'next' button, which is shown when their is an other page after the current one. Also there is a 'menu' button that is always visible as soon as the layout is active.